WBAI (99.5 MHz), is a non-commercial, listener-supported radio station licensed to New York City. WBAI is a Freeform radio station, staffed mostly by volunteers. Its programming is a mixture of progressive political news, talk and opinion from a left-leaning, liberal or progressive viewpoint, music programming featuring a variety of music genres and programs that serve New York City's minority communities. The station is owned by the Pacifica Foundation with studios located in Brooklyn and transmitter located at 4 Times Square. The station began as WABF, which first went on the air in 1941 as W75NY, of Metropolitan Television, Inc. (W75NY indicating an eastern station at 47.5 MHz in New York), and moved to the 99.5 frequency in 1948. In 1955, after two years off the air, it was reborn as WBAI (whose calls were named after then-owners Broadcast Associates, Inc.). WBAI was purchased by philanthropist Louis Schweitzer, who donated it to the Pacifica Foundation in 1960. The station, which had been a commercial enterprise, became non-commercial and listener-supported under Pacifica ownership. The history of WBAI during this period is iconoclastic and contentious. Referred to in a New York Times Magazine piece as "an anarchist's circus," one station manager was jailed in protest, and the staff, in protest at sweeping proposed changes of another station manager, seized the studio facilities, then located in a deconsecrated church, as well as the transmitter, located at the Empire State Building. During the 1960s, the station hosted innumerable anti-establishment causes, including anti-Vietnam war activists, feminists (and live coverage of purported bra-burning demonstrations), kids lib, early Firesign Theater comedy, and complete-album music overnight. It refused to stop playing Janis Ian's song about interracial relationships "Society's Child". Extensive daily coverage of the Vietnam war included the ongoing body count and innumerable anti-war protests. WBAI played a major role in the evolution and development of the counterculture of the 1960s and early 1970s. Arlo Guthrie's "Alice's Restaurant" was first broadcast on Radio Unnameable, Bob Fass' freeform radio program on WBAI, a program which itself in many ways created, explored, and defined the possibilities of the form. The station covered the 1968 seizure of the Columbia University campus live and uninterrupted. With its signal reaching nearly 70 miles beyond New York City, its reach and influence, both direct and indirect, were significant. Among the station's weekly commentators in the 1960s were author Ayn Rand, British politician/playwright Sir Stephen King-Hall, and author Dennis Wholey. The 1964 Political conventions were "covered" satirically on WBAI by Severn Darden, Elaine May, Burns and Schreiber, David Amram, Julie Harris, Taylor Mead, and members of The Second City improvisational group. The station, under Music Directors John Corigliano, Ann McMillan and, later Eric Salzman, aired an annual 23-hour nonstop presentation of Richard Wagner's Ring Cycle, as recorded at the Bayreuth Festival the year before, and produced live studio performances of emerging artists in its studios. Interviews with prominent figures in literature and the arts, as well as original dramatic productions and radio adaptations were also regular program offerings. In 1970, Kathy Dobkin, Milton Hoffman, and Francie Camper produced an unprecedented, critically acclaimed 4 1/2 day round-the-clock reading of Tolstoy's War And Peace. The epic novel was read cover to cover by more than 200 people—including a large number of international celebrities from various fields. Newsweek called this broadcast "one of the more mind-blowing 'firsts' in the history of the media". The complete reading (over 200 audio tapes) was the first Pacifica program to be selected for inclusion in the permanent collection of the Museum of Broadcasting in NYC. 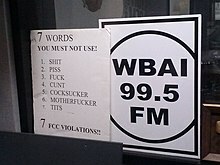 A poster in a WBAI broadcast booth warns radio broadcasters against using the seven dirty words. In 1973, the station broadcast comedian George Carlin's iconic Filthy Words routine uncensored. WBAI's broadcast of Filthy Words became a landmark moment in the history of free speech. In a 1978 milestone in the station's contentious and unruly history, WBAI lost a 5-to-4 U.S. Supreme Court decision (FCC v. Pacifica Foundation) that to this day has defined the power of the government over broadcast material it calls indecent. In 1974 WBAI program director Marnie Mueller asked Charles Ruas to become director of arts programming. Thus the station, already at the forefront of the counterculture and anti-war protest, also became a platform for New York’s avant-garde in theater, music, performance, art, and poetry. When the downtown avant-garde opera A Letter to Queen Victoria by Philip Glass and Robert Wilson opened at the Metropolitan Opera, the station was right there to tape excerpts in rehearsals for broadcast. Ruas initiated a year-long series on Marguerite Young’s epic novel Miss McIntosh, My Darling. These readings were transformed into performances by Rob Wynne, who scored them with a complex collage of sound effects, music, and opera. The participants included Anaïs Nin, Marian Seldes, Alice Playten, H. M. Koutoukas, Leo Lerman, Michael Wagger, Novella Nelson, Osceola Archer, Owen Dodson, Wyatt Cooper, Michael Higgins, Anne Fremantle, Peggy Cass, Ruth Ford, Earle Hyman and Daisy Alden. When William Burroughs returned to the United States from Tangier, Ruas invited him to present a retrospective of all his works. The series consisted of four programs, beginning with Junkie and followed by The Yage Letters, read by Burroughs and Allen Ginsburg, The Last Words of Dutch Schultz, and, finally, Naked Lunch. Bill Kortum oversaw this series as well as retrospectives of the works of Jerzy Kosinski and Donald Barthelme, co-produced with Judith Sherman, the station's music director. A semester of Allen Ginsberg's poetry seminar held at the Naropa Institute in Colorado was presented by Ruas, and for many years the station covered the annual New Year’s Eve celebratory poetry marathon at St. Mark’s Church. The day the Vietnam War ended, poet Muriel Rukeyser came to the station to read her poem on peace. Ruas inaugurated the Audio Experimental Theater, a series presenting the works of avant-garde artists: Meredith Monk, Yvonne Rainer, Ed Bowes, Michael Newman, Joan Schwartz, Benjamin Folkman, Vito Acconci, Charles Ludlum, Jacques Levy, Willoughby Sharp, John Cage, Robert Wilson, Philip Glass, Richard Foreman, and Joan Jonas. In drama, the station defended Tennessee Williams against his critics during the last years of his life by covering his Memoirs and broadcasting a production of Two-Character Play. Other dramatists whose works were featured included Jean-Claude van Itallie, Richard Scheckner, Andrei Serban, and Elizabeth Swados. Ruas initiated interview programs featuring nonfiction writers discussing their fields of expertise—Buckminster Fuller, Thor Heyerdahl, Ed Sanders, Jonathan Kozol and Nigel Nicholson. Each of the arts had weekly coverage. Courtney Callender’s Getting Around covered the cultural scene. Moira Hudson was the dance critic. The visual arts critics were John Perreault, Cindy Nemser, Liza Baer, Joe Giordano, Judith Vivell, Kenneth Koch, and Les Levine. Susan Howe produced a weekly poetry program presenting the works of John Ashbery, W.S. Merwin, Maureen Owen, Charles Reznikoff, Rebecca Wright, Ron Padgett, Carter Ratcliff, John Hollander, Anne Waldman, Helen Adam, Audre Lorde, Michael Brownstein, Mary Ferrari, and Muriel Rukeyser. She also produced specials featuring William Carlos Williams, V. R. Lang, Jack Spicer, Louise Bogan, Paul Metcalf, Jonathan Williams, Harry Mathews, and James Laughlin. John Giorno presented his 5-part series Dial-a-Poem Poets. For a few years WBAI became a cultural force as these programs were disseminated nationally through the Pacifica Network. In 1977, there was a major internal crisis at WBAI which resulted in the loss of the physical space of the station. WBAI was located in a former church on the Upper East Side of Manhattan. For many years WBAI had believed it was exempt from New York City real estate taxes as an "educational" institution, but in March 1977 the City Tax Commission denied that status and WBAI eventually sold the church (which it owned) to pay the back taxes. WBAI signed a new lease for the 19th floor (the former Caedmon Records office/studio) plus one office on another floor of an office building at 505 8th Avenue on the West Side of Manhattan. After the events in 1977, the station began a shift to a more profound international direction. In 1980, Caribbean immigrant and Marxist activist Samori Marksman was hired as WBAI Program Director and with his ascension, there was more of a focus on international issues and the promotion of people of color to the WBAI staff which caused grumbling among long time white and Jewish progressives who felt they were being pushed out of the station. In 1983, Marksman abruptly left for the Caribbean island of Grenada to participate in a new government - a government that was thwarted by the US invasion of Grenada in October 1983. In 1986, gay activist John Scagliotti became program director and he initiated many program changes and still more long-time programmers left the station. Scagliotti tried to professionalize the programming and smooth out the rougher edges of existing shows. During his tenure, several producers received accolades for their efforts including Robert Knight who won a Polk Award for his show "Contragate", future program director and Station Manager Valerie Van Isler won awards for her role in the film, "The Panama Deception" and award-winning producer and host Amy Goodman began her career under Scagliotti. Samori Marksman returned to WBAI in the early 90's and in 1994, he was hired again as WBAI's Program Director and during his five-year tenure, WBAI achieved significant progress in listenership and fundraising. Marksman founded "Democracy Now" in 1996, the award-winning program now helmed by Amy Goodman. Marksman was deeply-connected to the Caribbean and African diaspora and his own program "Behind The News" focused on international and national issues from a black nationalist and Marxist perspective. Marksman was profoundly loved by a broad cross section of the WBAI audience and staff and his shocking and sudden death from a massive heart attack on March 23, 1999 was a wound to the station that lasted for years. Over 3,000 people attended his funeral at the Cathedral of St. John the Divine in Manhattan. Shortly before the death of Samori Marksman and following years of complaints about the outdated and filthy studios at 505 Eighth Avenue in New York, WBAI moved to new studios at 120 Wall Street in the Financial District in Manhattan in June 1998. After the death of Marksman, there was profound uncertainty and an explosion of pent-up feelings and resentments that was suppressed by Marksman and Mario Murillo, the Public Affairs director. Utrice Leid, a popular Caribbean radio host and producer had expected to succeed Marksman but was denied the post by then General Manager Valerie Van Isler. This led to an intense battle between various factions inside and outside the station and with The Pacifica Foundation, the parent company of WBAI. The culmination of this conflict was the "Christmas Coup" in December 2000 when a faction led by Leid, padlocked the station and took control of the airwaves and started an on-air and off-air war that lasted for several years. Some senior WBAI staffers, including General Manager Van Isler, were fired immediately. Van Isler, in particular, was blamed for the early death of Marksman. In 1994, Van Isler initially refused to hire Marksman, claiming Marksman had a mediocre credit report, then later in his tenure, refused to give him a salary increase. The autocratic and unpopular Van Isler also vigorously fought former staffers from obtaining unemployment benefits, including Bill Wells, the former WBAI Chief Engineer, who had a disability. In late 2012 WBAI suffered extensive damages to their offices following the events of Hurricane Sandy. The Manhattan offices saw flooding reach the second floor, trapping seven staffers inside, and the telephone systems being disabled. The devastation by Sandy occurred in the midst of fundraising efforts, which ultimately prevented WBAI from acquiring the necessary funds to remain operational. As a result of funding and operational difficulties, WBAI announced in 2013 it would be moving out of those studios to temporary studios of WHCR-FM located in Harlem, a station operated by City College of New York (CUNY). Lynne Rosen and John Littig, co-hosts of the monthly show The Pursuit of Happiness, were found dead on June 3, 2013, after committing suicide in their Park Slope home. In June 2013 the Corporation for Public Broadcasting suspended payments to WBAI citing accounting irregularities and a failure by the station to meet its financial obligations. Layoff notices effective July 15 were subsequently issued to the station's staff and management. On August 9, 2013, Pacifica management announced that due to financial problems, WBAI was laying off about two-thirds of its staff, effective August 12, 2013. The entire news department was laid off. Summer Reese, the interim executive director of the Pacifica Foundation, which owns WBAI, said that after talks with SAG-AFTRA, the union that represents broadcasting talent, "we will be laying off virtually everyone whose voice you recognize on the air," effective Monday. She corrected that and announced the final number was 19 out of the station's 29 employees, about 66 percent. Andrew Phillips, the former general manager of another of Pacifica's five stations, KPFA in Berkeley, California, was appointed WBAI's interim program director. The New York Times reported that the station owes $2 million in broadcast fees to Democracy Now! alone, while cash on hand was just $23,000. In March 2014 there were assorted rumors that the station will be sold or leased or moved, in whole or in part (including their equipment and antenna at the Empire State Building) after contentions and firings both at WBAI and at Pacifica headquarters. On December 17, 2014 the California State Attorney General opened a full and formal investigation into the Pacifica Radio Foundation, owner of WBAI, with respect to its alleged irregularities as to its finances, violations of California law with respect to nonprofit organizations, and violations of its own bylaws. In 2015 WBAI moved to new studios and offices at 388 Atlantic Avenue in the Boerum Hill section of Brooklyn. On October 4, 2017 the court rejected WBAI’s pleadings as ill-founded and granted the Empire State Realty Trust (ESRT) a summary judgement, in the amount of $1.8m plus attorney’s fees, immediately, for the monies due through the initial filing date of late 2016. ESRT was awarded with an additional $600k for the lease through the date of the court’s ruling and obligations of approximately $50k+ per month through lease expiry in 2020, also remaining in place. A further settlement was announced on April 6, 2018, releasing WBAI from the court judgment and its obligation to continuing leasing the Empire State tower into 2020, with tentative plans for a new transmitter at 4 Times Square. ^ WABF (FM) Broadcasting - Telecasting. October 27, 1947. pg. 48. ^ CALL LETTERS ASSIGNED Broadcasting - Telecasting. July 4, 1955. pg. 83. ^ "RADIO: WBAI in the Sky". Time Magazine. January 25, 1960. Retrieved January 12, 2016. ^ Christopher H. Sterling; Cary O'Dell (12 April 2010). The Concise Encyclopedia of American Radio. Routledge. pp. 551–. ISBN 978-1-135-17684-6. ^ Collins, Glenn (June 25, 2008). "The Station That Dared to Defend Carlin's "7 Words" Looks Back". The NYTimes. Retrieved September 14, 2018. ^ "Voice of the Cabal". Newyorker.com. 2006-12-04. Retrieved 2015-05-17. ^ Collins, Glenn (June 25, 2008). "The Station That Dared to Defend Carlin's "7 Words" Looks Back". The NYTimes. Retrieved January 12, 2016. ^ Active Radio: Pacifica's Brash Experiment. U of Minnesota Press. 1999. p. 116. ISBN 0-8166-3157-3. Retrieved 2012-02-23. ^ Collins, Glenn (June 25, 2008). "The Station That Dared to Defend Carlin's '7 Words' Looks Back". The New York Times. Retrieved 2012-02-23. ^ "WBAI‐FM May Sell Its Studio". The New York Times. November 26, 1977. Retrieved 2016-12-30. ^ a b Matthew Lasar (11 February 2013). "Volunteers needed to help WBAI in NYC move to City College station". Radio Survivor. Retrieved 12 February 2015. ^ Matthew Lasar (11 July 2013). "CPB on WBAI: the good news is that we are talking, but . ." Radio Survivor. Retrieved 12 February 2015. ^ "Co-hosts of radio show 'The Pursuit of Happiness' committed suicide". NY Daily News. Retrieved 5 June 2013. ^ Ben Sisario (August 11, 2013). ""WBAI-FM Lays Off Most of Staff"". The New York Times. Retrieved 2015-05-17. ^ Ben Sisario (August 20, 2013). ""Democracy May Prove the Doom of WBAI"". The New York Times. Retrieved 2015-05-17.